While the rest of the world seems to pursue the electric car, Japan is heading in another direction: vehicles powered by hydrogen fuel cells. A hydrogen cell uses a chemical reaction between hydrogen and oxygen to produce electricity. And instead of greenhouse gases, they discharge only water. 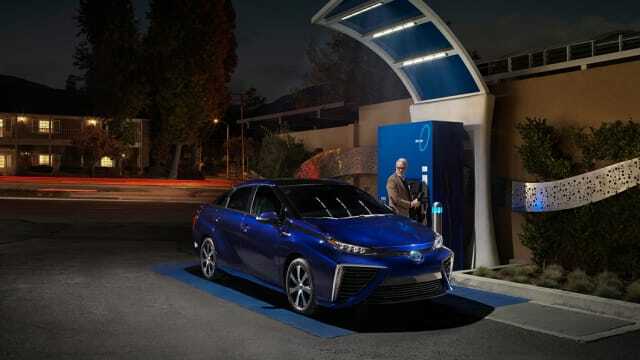 Toyota and the Japanese government believe that the country is ideally suited to hydrogen vehicles. A majority of the population lives in dense urban centers—many of them in apartment buildings with no room for an electric car charger. The hydrogen fuel cell would be a convenient alternative. Japan is working on showcasing a “hydrogen society” during the 2020 Olympics. Host city Tokyo plans to roll out 100 hydrogen fuel cell buses during the games, in addition to 40,000 fuel cell electric vehicles—with a long-term target of 200,000 on Japanese roads in the next six years. Currently there are only about 11,000 hydrogen fuel cell cars operating around the world—compared to the five million electric cars in use. That isn’t stopping Toyota from making a commitment to the technology, though. The carmaker has already unveiled the Mirai, a hydrogen-powered car. But the Mirai is expensive even with a generous government subsidy, costing upwards of $50,000. The largest cost is the fuel cell production, but Toyota claims that production increases will lead to a drop in price. Toyota unveiled its hydrogen-powered Mirai in 2016. Another difficulty is putting the requisite infrastructure in place. Hydrogen cars won’t sell if there is no place to conveniently refuel—but if no one is buying the cars, companies won’t invest in the fuel stations. The Japanese government is offering investment subsidies in response, and is working with companies like Toyota to fund 100 hydrogen fueling stations so far—with a target of 900 by 2030. By then, the hope is that there will be enough hydrogen vehicles for the stations to turn a profit. Last year a group of 11 Japanese companies, including Toyota, Nissan and Honda, launched the Japan H2 Mobility venture to build 80 hydrogen fueling stations by 2022—and 12 are already near completion. Kawasaki Heavy Industries and other companies also announced a project to extract hydrogen from brown coal in Australia, liquefy it and ship massive amounts to Japan to try to lower costs. It’s a promising start but there is much to do before the cars become commonplace. “The guy sitting in the hydrogen fueling station will be very, very lonely for quite a while,” said Bertel Schmitt, a former auto industry executive living in Tokyo. Read more about hydrogen vehicles at Student-Built Hydrogen EV Breaks World Record for Fuel Efficiency.